Located next to the Pacific in Mexico, Guerrero is home to several major towns including Ixtapa, Taxco and La Quebabra but it is arguably most famous around the world for a major tourist centre called Acapulco which is dominated by tall hotels and afforded a scenic background by the mountains. Attracting world attention for an alarming rate of crime, unfortunately what was once a prosperous region is now experiencing some difficult times. Aside from a beautiful tropical coastline, the region is mostly inhabited by mountainous scenery with the Sierra Madre being the main culprit. However with cascading waterfalls, rivers, forests and lowlands on the interior, there is certainly variety to how the land lies in Guerrero. As for the climate, the region enjoys a lot of tropical rains with high temperature all year round (18 degrees Celsius) with the exception of the highlands which are normally a lot cooler. Afro Mexicans make up part of the near four million population in Guerrero but indigenous tribes are more common in this part of Mexico. 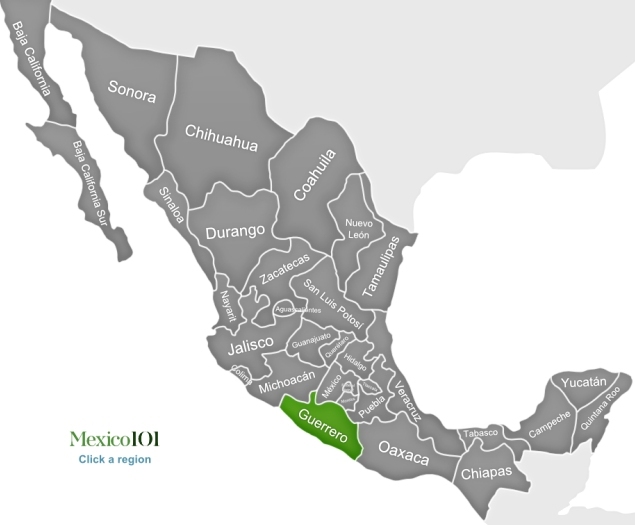 With more than 4 indigenous groups living in the region, Guerrero is very important in terms of culture and this means it is also home to many different tribes including the Nahuas, Mixtecs, Tlapanecos and Amuzgos. There are also more than 22 different languages spoken by these tribes and they mostly live within the more isolated parts of the mountains. Acapulco was one of the very first holiday and getaway destinations and was the location of choice for many celebrities back as far as the 1950s. Beaches, food and cocktail bars made this resort very enticing and led to the rise in popularity of nearby resorts Taxco and Zihuatanejo. However, a rise in crime and drugs in Acapulco has seen a stark fall in visitors in recent years. The three aforementioned resorts make up what is known as the Golden Triangle in Mexico. Pottery and arts are very prominent within the local culture of Guerrero where beautiful vases, pots and sculptures are produced in mass quantities. This has allowed for excellent employment opportunities for the indigenous people who are best at making them and many handicrafts are often produced in the towns of Temalcalcingo, Olinala, Ocotepec, Acapetlahuaya and Ocotepec. Unfortunately Guerrero has been the subject of controversy for many years with an escalating drugs problem and a large increase in the number of gang related crimes. This has severely damaged the tourism industry and is often the reason for which travel to the region is not encourage by most travel advisories.